It is a fact that since history started being recorded in word form, there have been documented reports of Sea Serpent sightings. These sightings have occurred in nearly every ocean, sea, and large lake from all around the world. The descriptions of these creatures being seen are generally vague in terms of closeup detail, but they almost always have the same three identifying factors in their retelling; size, shape, and color. Usually, these stories are told in an "I heard it from a guy who heard it from a guy" type of way and typically happen to leave out a fair amount of needed detail to accurately verify whether the tale has any truth to it. These sightings are most often taken with a grain of salt and usually chalked up to many witnesses being unfamiliar with and misidentifying any of the amazing deep water creatures that we know so much about today. Because of this, many of these stories and legends are thought to be just that, stories and legends with no basis in truth whatsoever. But scattered among the massive amount of possible fake sightings and encounters, are the ones that may be real. The rare ones where the witnesses are backed up by other witnesses who are also backed up by more witnesses. The kind where the details of the encounter and the description of the creature (or creatures) were written down and recorded in an official setting. The kind of reports where those who raised their hand and swore to them would have no real reason to lie or deceive the public. These are the encounters that cannot be so easily explained away, the ones that even after extreme scrutiny, still come across as possibly being real. One of these rare encounters took place between 1897 and 1898 and involved the crew of the French gunboat, The Avalanche while patrolling the waters around the coast of Vietnam (known as Indochina at the time). While one well documented historical sighting is quite rare, the crew of The Avalanche would find itself documenting a relatively unheard of three closeup sightings of what appears to be the same animals. Each report would go on to provide details of the unknown creatures that could have only been gathered by someone watching from a close proximity and who was already familiar with the known aquatic wildlife of the area. The first of the three reports took place in July of 1897 while The Avalanche was traveling through Ha Long Bay in northeast Vietnam when it encountered two animals of "weird shape and description" swimming parallel to the vessel at a distance in the emerald waters. An officer on the boat by the name of Lt. (Lieutenant) Lagresille took it upon himself to document what the crew was witnessing so as to accurately report back to his commanding officers on the mainland. Lagresille, along with the rest of the crew, estimated the two creatures alongside them to be between 60-65ft in length and roughly 8-10ft in diameter. The mystery creatures moved through the water like giant snakes, but instead of moving with lateral undulations as a snake would, they made movements in a vertical direction. The skin color was described as a dark gray and what the crew assumed were multiple fins were spotted along each side of the creature. The heads were seen briefly and appeared to be much smaller than what would be expected on an animal of this size. As a majority of the crew watched in shock and amazement at what was swimming near them, one crew member took it upon himself to try and rid the area around the ship of any possible dangers the mystery creatures might bring if they got closer. The unnamed crewman loaded his revolver, readied his aim, and took a shot at one of the animals. Lagresille stated that at this time, the creatures had put a distance of over 300 yards between them and the ship. Because of this, the crewman who had fired the shot had missed his intended target and instead hit the water causing a burst. While unharmed, it was the sound of the shot and this burst of water which had caused the two mysterious animals to raise their small heads, loudly take a breath, and dive back down below the surface and out of sight. After this sighting, the crew of The Avalanche got back on their designated course and continued patrolling the waters around Vietnam. The crew, believing the creatures were nothing more than a singular odd occurrence at sea, went back to their daily routine never giving the sighting a second thought. That is until they were seen again. The second encounter between the unknown serpent-like creatures and The Avalanche took place seven months later on February 15th, 1898 while the ship was patrolling the waters around a group of islands known as the Fai Tsi Long Archipelago. Lt. Lagresille once again documented the encounter, this time writing of how the ship was instructed to give chase to the creatures in order to bring their bodies back to port for further study. The officer wrote of how the large revolving gun on board was also loaded and made ready to fire upon the creatures whenever they had a clear shot. The recorded encounter states that after the ship began its pursuit, the two animals split from each other and essentially took a position on each side of the boat. The creatures were recorded as keeping a distance of between 300-400 yards and were said to have been chased at speeds upwards of 13mph into both open water as well as shallow areas close to land. When the opportunity presented itself, the ship was ordered to ram the creatures in order to stop them, but the two animals proved much faster and more agile than Lt. Lagresille anticipated. It was during these moments of agility that the men were able to see the great size of the creatures as they passed by the ship. During this second encounter and pursuit, The Avalanche was able to shoot at the creatures multiple times. While they were unable to successfully hit the beasts, mostly due to their incredibly fast and quick movements, they did cause the two animals to break the surface quite often. Lt. Lagresille reported that every time a shot hit the water in close proximity to one of the aquatic beasts, they would break the surface, open their mouth to exhale loudly, release a jet of water vapor from their mouth, inhale loudly, and proceed to dive again. It is this specific part on breathing that must be noted as Lt. Lagresille made sure to explain that this jet spray of water was not like that of a whale. The creatures did not have blow holes in which they inhaled water and blew it back out upwards into the air. These creatures essentially shot the water from their mouth and it fell downward, back into the water. After the creatures rose to take their breath and dove back down below the surface, the ship was still able to track their movements. Lagresille wrote of how the creatures appeared to be exhaling while underwater as large air bubbles would rise to the surface and create circles on the water which showed the paths the unknown beasts were on. The Avalanche continued this chase and shoot technique while following the creatures around the islands until they had run completely out of daylight. Lt. Lagresille stated that the chase had gone on for more than an hour and a half and would have continued if it weren't for nightfall. Defeated and understandably upset, the crew of The Avalanche got back on course and started their trip back to port. While there, Lt. Lagresille attended a gathering which included the governor of Indochina (Vietnam) and future president of France, Paul Doumer. As the two men spoke, Lagresille brought up his and his crewmates recent encounters with the two unidentified sea creatures in both Ha Long Bay and the Fai Tsi Long Archipelago. Instantly intrigued at what he was hearing, Doumer instructed The Avalanche to return to the Fai Tsi Long Archipelago the next day and once again search for the creatures. Lagresille instantly obliged as he hoped his next encounter would result in the capture of one, if not both, of the creatures. On February 26th, 1898, Lt. Lagresille and the crew of The Avalanche, as well as additional crewmen from the ship The Baynard, returned to the island waters around Fai Tsi Long to search for the creature. And it didn't take long to spot them in the waters once again as the now experienced crew knew exactly what to look for in order to pick up the trail of the beasts. After sighting the distinct bubble circles created by the creatures, Lagresille ordered The Avalanche to ready its guns and give chase. As usual, the creatures took off at great speed both below and above the water. It was reported that during this encounter, the men were able to get a more detailed look at the heads of the animals. Lagresille wrote that the head shape of both creatures looked almost seal-like in appearance, but much larger and without a noticeable neck. They sat on a snake-like body that undulated vertically through the water and often created the appearance of three humps on the surface of the water. It was said that if one were to not know these creatures were long and serpent-like in appearance, you could almost be fooled into thinking the body shape was like that of a whale due to the viewing of these false humps. The ship once again attempted to drive the mystery beasts into shallow water, but the agile animals were easily able to quickly turn and speed past the ship back out into deeper water. During one of these attempts, one of the creatures got so close to the boat that Lt. Lagresille was able to spot what looked like saw-like hair or spines protruding from the top of the creatures dark gray body. It was reported that these spines resembled nothing that the men of The Avalanche had ever seen before, and most certainly did not look to be part of any known animal currently residing in the coastal waters around Indochina. Along with the saw-like hair/spines spotted on the creature, Lagresille was also able to more clearly see the black fins that had been reported during the first sighting. The fins were stated to be slightly whale-like in appearance and were situated near the front of the creature, as well as near the back, closer to the tail. After this close passing, the creature dove back into the deep water before appearing later near its counterpart some 200 yards away. As the creature rose, it once again let out a loud exhale and shot a vaporous stream of water out of its mouth before diving once again. Quickly after the first creature dove, the second proceeded to let out its own loud exhale and dove as well. And after that, the beasts were gone. Lt. Lagresille reported that the crew of The Avalanche pursued these two mystery animals around the islands for nearly thirty-five minutes before they had disappeared for good. Even after doing a thorough search of the surrounding area, they were not seen again. The crew had once again been defeated by something they could not explain. While the crew of The Avalanche was never able to capture the creature for further study, that does not mean an attempt to classify it has never been done. In 1965, zoologist, author, and cryptozoologist Bernard Heuvelmans theorized that what Lt. Lagresille and the men of The Avalanche had seen/encountered was actually what he described as a Many-finned Sea Serpent. These creatures, as Heuvelmans claimed, were a species of marine animal that was said to possess a wide range of fins along their sides and back. They were also believed to be able to grow to lengths anywhere between 30 and 100ft but were mostly recorded by witnesses as being around 60-70ft. There are many other similarities between Lagresille's mystery creatures and Heuvelmans Many-finned Sea Serpent that make this comparison all the more probable. The Many-finned is described as having skin tones between dark brown, dirty yellow, or greenish gray. They are also believed to have a small round head that looks like it belongs on a walrus, cow, or seal. They have visible nostrils surrounded by hair and were described by witnesses as having a saw-like crest running along the length of their spine. 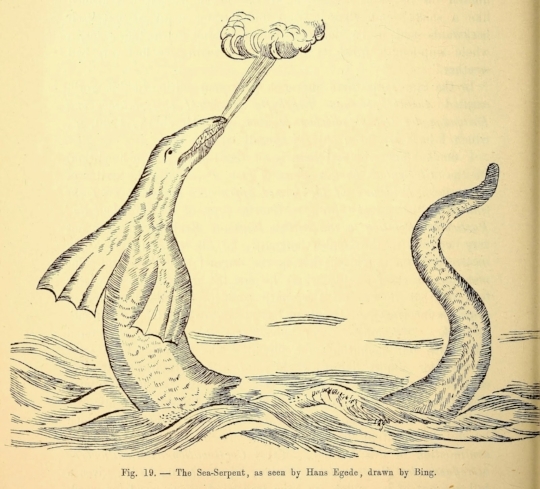 The final major comparison between the two creatures is that my witnesses of the Many-finned Sea Serpent describe it as having the ability to spray water from its mouth and because of this, its breath is generally visible. When it comes down to it, it is not hard to believe that what the crew of The Avalanche saw was a Many-finned Sea Serpent. And while there has been no solid evidence that proves the existence of these mystery creatures proposed by Heuvelmans so many years ago, it is not hard to believe they exist based solely on the sheer size and largely unexplored areas of the earths ocean. Also, reports of creatures that are described almost identically by cultures thousands of miles apart that had no way of communicating at the time of the original sightings, makes one believe that these people truly did see something out of the ordinary. But, one cannot accept blindly that an unverified animal is the culprit behind all these sightings. There are many known creatures in the open ocean that are rarely seen by humans, and even more that have only been veritably seen a handful of times. Perhaps what witnesses of these serpents were actually seeing was on oarfish, or possibly a misidentified False Killer Whale? Maybe a group of Finless Porpoise is responsible for the sightings, or maybe a common Goliath Grouper was the culprit. While the true identity of the mystery creature may never be known, one must remember that it is foolish to instantly settle on the unknown without first checking into the known. So, could these Many-finned Sea Serpents be real? Or are these stories nothing more than tales of the big one that got away?